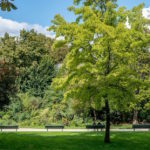 The garden of the Observatory ( also called garden of the great explorers : Marco Polo and Cavelier-de-la-Salle), is a beautiful green area of the 6th district, created in the late 19th century to be an urban sprawl to the nearby Luxembourg gardens. Nowadays, if you are looking for a peaceful and human-sized spot, it stands as a real alternative to its wide crowded neighbor. 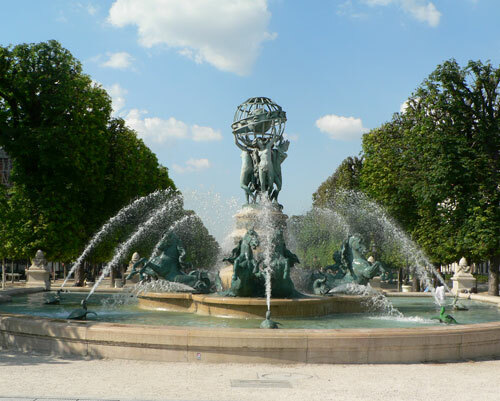 The main attractive element in this garden is the fabulous Fountain of the Observatory, a real open- air Parisian monument. 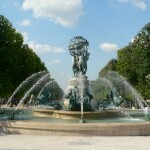 Built between ­ and 1867 and 1874, this fountain is a collective work of many French sculptors such as Gabriel Davioud and Jean Baptiste Carpeaux. 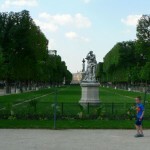 Besides, you will find all around the park so many statues offering a nice scenery and a magnificent view on the Luxembourg park. Besides this great ornament, you will enjoy in the Observatory public garden large open lawns and a laying out suitable for nice walks. The buildings running along the avenue (erected in 1867 by Davioud, who was at that time Head architect of Promenades and Public Gardens of the City of Paris), are worthy of a particular interest. You will for example find there The Pharmacy College, The Institute of Art and Architecture, and many others public buildings. Inside the pharmacy College is by the way a beautiful botanical garden you can visit for free : le jardin Botanique de la Faculté des Sciences Pharmaceutiques et Biologiques. 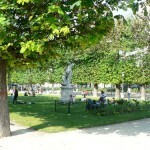 This garden being ideally located between the Montparnasse area and the 6th and 5th districts of Paris, don’t hesitate and push on your discovery walks through the city and fall for the great charm and distinctive of these areas (Tour Montparnasse, Montparnasse Cemetery, Bourdelle Museum or Zadkine Museum).